1) Musicians know when a gig has really worked; when all the practicing, rehearsing, playing, set-list comes together in a particular time & venue with a particular audience. 2) King Crimson is a band that’s best experienced live & if you can’t be there, the live album is the next best thing. 3) When musicians unanimously say that a concert was special, it’s time to pay attention & plan a release for the broader community of fans as soon as is possible. King Crimson evolves, changes, morphs as relentlessly as the Soundscapes which open each concert. Since the 2016 tour of Europe, the band has become a double quartet line-up with Bill Rieflin’s return from sabbatical as keyboard player & Jeremy Stacey’s confirmation as a permanent member/third drummer. This allows for the inclusion of an ever more complex & compelling array of material, far more than can be contained in a single concert. With options for up to three keyboard players in the current line-up – Fripp & Stacey both have setups alongside their respective guitar/drum rigs - the majority of Lizard is performed live for the first time ever, likewise Fallen Angel from Red is making its first ever concert appearance/live recording, Cirkus envelops the listener in sound, the beautiful title track from Islands closes the first set, while staples from the 1980s line-up Indiscipline and Neurotica appear in very different arrangements. New piece, The Errors makes its recorded debut & current audience favourite Heroes appears in the encores at the end of Disc Two. Add to this list of concert newcomers & returnees, live staples of the recent tours such as Starless, Easy Money, a recording of Level Five described as the “best ever single performance” of the piece by King Crimson biographer Sid Smith & a storming ending provided by the evergreen 21st Century Schizoid Man & it’s easy to see why the band was so pleased with this gig & the audience went home happy. 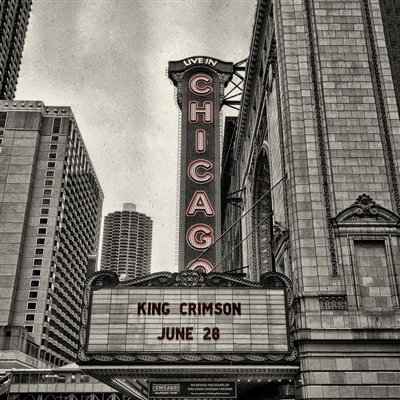 Presented as a King Crimson Collectors’ Club special edition, King Crimson Live in Chicago is packaged in a media-book style hard cover 2CD edition with a 24 pages booklet featuring photographs by Tony Levin, introductory notes by Robert Fripp & photos/production notes by KC producer/manager David Singleton. King Crimson continues to re-invent & re-imagine both itself & its music; the kind of thing that once would have been called a “progressive” approach. It’s an approach that has benefited band members and listeners alike from January 1969 to the present – September 2017. The band is on tour in the USA in October & November 2017, with a European tour planned for 2018. Meanwhile, King Crimson: Live in Vienna, 2016 – originally scheduled for release this autumn will be released in Japan this autumn & in all other countries in early 2018, while DGM Japan will issue Live in Chicago early in 2018.